Embarrassed by some of your first tweets from 2007? Wish you hadn’t got involved in that drunken virtual brawl on Twitter last Christmas? There was a time when you could safely assume that those ramblings would be lost in the mists of Twitter’s archive never to be seen again. A search on Twitter would only give the last few days worth of postings and Google no longer archives the whole of Twitter. True, the Library of Congress does keep copies of every single tweet for posterity but access is only allowed for serious research purposes. So far, the Library has received about 400 inquiries but has not yet been able to provide access (http://blogs.loc.gov/loc/2013/01/update-on-the-twitter-archive-at-the-library-of-congress/). So you can breathe easily again? Unfortunately not. There are commercial organisations such as Datasift (http://datasift.com/) and Gnip (http://gnip.com/) that charge an arm and a leg for analysing tweets and other social media comments, but the cost puts their services out of the reach of the casual searcher. You may find, though, that your forthright hashtagged tweets at a conference have been recorded for all to see free of charge (Sharing (or Over-Sharing?) at #ILI2012, http://ukwebfocus.wordpress.com/2012/11/02/sharing-or-over-sharing-at-ili2012/). And Twitter, itself, is finally providing access to historical tweets. You can now download your entire collection. 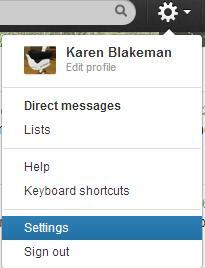 Go to your Twitter home page, click on the cog wheel in the upper right hand corner and select settings. At the bottom of the Settings page is a link to request your archive. You should receive an email a few minutes later with a download link. The file is zipped and once you have unpacked it you can browse your tweets by year and month or search the archive using keywords or hashtags. I have not been able to work out how often you are allowed to download your archive and, rather annoyingly, there is no top-up option. There are also links at the top of the results page that enable you to view Top, All, and tweets from just ‘People you follow’. There are in fact advanced search commands that can be used to include a date range in your search (see https://support.twitter.com/articles/71577 for details). 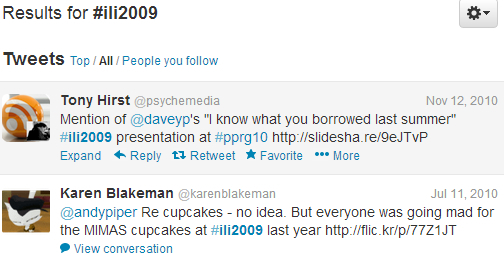 Changing my search to #ili2009 since:2009-10-01 until:2009-10-31 did seem to work. I am not convinced, though, that Twitter is giving me everything, even when I choose ‘All’. It’s a start and long overdue, but I’m not going to abandon my own archiving strategies just yet. I had a fantastic week at SAOUG’s 11th Southern African Online Information Meeting (#saoim) this week. I gave a workshop and a keynote conference paper (details to follow in a separate post) but did not tweet as much as I usually do mainly because I was so busy talking to people and making new friends. The conference programme was excellent and I picked up many new ideas that I’m going to work on over the next few months. SAOUG (Southern African Online User Group) who had organised the meeting had also set up a group of social media reporters whose responsibilities were to tweet and blog the event. They did a great job and on one of the main conference days #saoim was trending on Twitter in South Africa! 2011 is proving to be a vintage year for disposing of Google search options. Google, in common with most search engines and database providers, is quick to announce wonderful new search features but tardy in telling users about discontinued tools. In fact, it generally takes several messages to the Google support forums about something not working in order to elicit the news that a service has been withdrawn. UK Google Maps property search was one of the first to go this year. Google had done deals with several UK online estate agents so that when you ran a search in Google Maps on your post code together with the word property you were presented with a Google map showing all the properties for sale or rent in your area. You could even specify price range, the number of bedrooms and bathrooms. The service was discontinued in February of this year with “low usage” being given as one of the reasons. That’s hardly surprising because after the launch Google did almost nothing to promote it and did not even offer a hint on the UK Maps home page that it existed. Next to go was starred results. This enabled you to star or bookmark pages in your results list so that next time you ran a similar search they would appear separately at the top of your results. The ‘define:’ command was the next to be axed although the same functionality is still available under the Dictionary link in the left hand menu on the results page. Instead of simply prefixing your term or abbreviation with define: you now have to run a search on it and then click on Dictionary. The results are the same but it requires a couple of additional clicks to get there. Next up were the numerous changes to the appearance and layout of the results page in the runup to the launch of Google+. One casualty was the ‘Similar’ link that used to appear next to most entries in the results page. This would find pages similar in content and from similar types of organisations to your selected page. Although it has gone from the results the related: command is still available and it remains on the Advanced Search screen. Another victim of the revamp was the Wonderwheel. 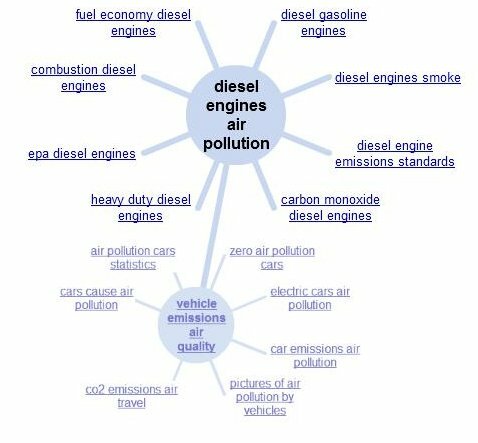 This was a great way of exploring concepts and alternative search terms within a search, especially if you are working in a subject area new to you. The closest alternative is the Related Searches option in the menu on the left hand side of the results screen. It doesn’t allow for the same ease of navigation between searches and doesn’t match the variety of terms and phrases that the Wonderwheel offered. 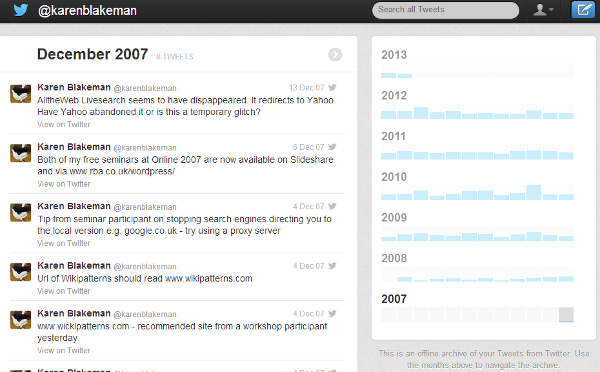 The latest disappearance is Realtime search, which returned mostly Twitter results. The contract giving Google direct access to Twitter expired on July 1st and Google have not renewed the contract. This started out as a very useful Twitter search tool as Twitter’s own search at http://search.twitter.com/only returns results from the last few days and many of the advanced search commands do not work. More recently, though, Google Realtime became unreliable and started returning increasingly bizarre results, usually with hashtags because it would automatically correct what it thought was a spelling mistake. You can still use Google to search Twitter by combining your search terms with site:twitter.com but it does not pick up everything. Bing Social is a little better and Topsy.com is generally good but neither pick up everything. As an example, I recently attended and spoke at the South West and Mid Wales Library Partnership staff conference. The hashtag was #swamp11 and two days after the event the archive document I created in Tweetdoc (http://www.tweetdoc.org/) listed 185 tweets, which tallied with the number in my own record. Bing Social finds 75 tweets, Topsy tracks down a mere 38 and when you force Google to do an exact match search together with site:twitter.com you get a paltry 4 results. And finally…. a search option that many researchers find invaluable seemed to have vanished over the weekend. A link to the Advanced Search screen had vanished from the Google home page, as had Language Tools. Both are now hidden under the gear icon in the upper right hand corner of the screen. Tweetdeck sneakily forcing users to use deck.ly? This morning I updated Tweetdeck and one of the new features is the incorporation of a service called deck.ly. This allows you to tweet more than 140 characters. Type in your tweet in Tweetdeck and as soon as you go over the limit of 140 the background in your tweet box turns yellow (this may vary depending on whether or not you have customised your colours). Next to the Send button you’ll also see a new button “Long update using deck.ly”. Tweetdeck users will see the full text of the extended tweet but others will have to click on a link. A debate has already started around this new option and I am not going to repeat the arguments here. I am more concerned about what has happened to auto URL shortening. After the update I wrote a tweet and then added a URL that took my tweet over the 140 character limit. The background turned yellow and I waited for the URL to be shortened. It wasn’t. I had to click on the link to shorten it. I mentioned this on Twitter and, at the time of writing, no-one else seems to be having the same problem. So I decided to run some test tweets and this is what I am seeing. I hope that this a bug and not some attempt by Tweetdeck to force us to use Deck.ly. I have experimented several times over the last couple of hours with different tweets and see the same results every time. No-one else in my network seems to be having the same problem, though, which is making me feel a little paranoid. If you have updated to the latest version of Tweetdeck I’d be interested to hear whether or not your experiences are the same as mine. Further background information: I ran these tests using Tweetdeck version 0.37.2 under Windows 7 professional (updated with multiple updates earlier this morning) on an HP laptop.